Home › Current Events › Creation vs. Evolution: Can We All Just Calm Down, Please? Creation vs. Evolution: Can We All Just Calm Down, Please? 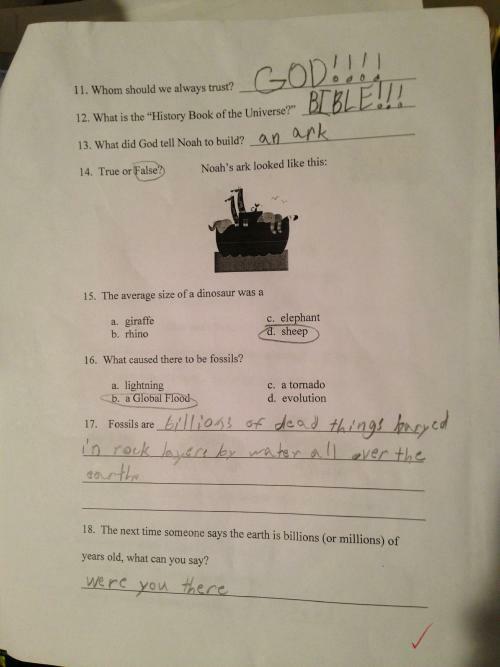 This just viral: a fourth grade science quiz. Normally, grade school science quizzes are not that interesting. But when the correct answer to the true/false question “The earth is billions of years old” is “false,” that gets people’s attention. 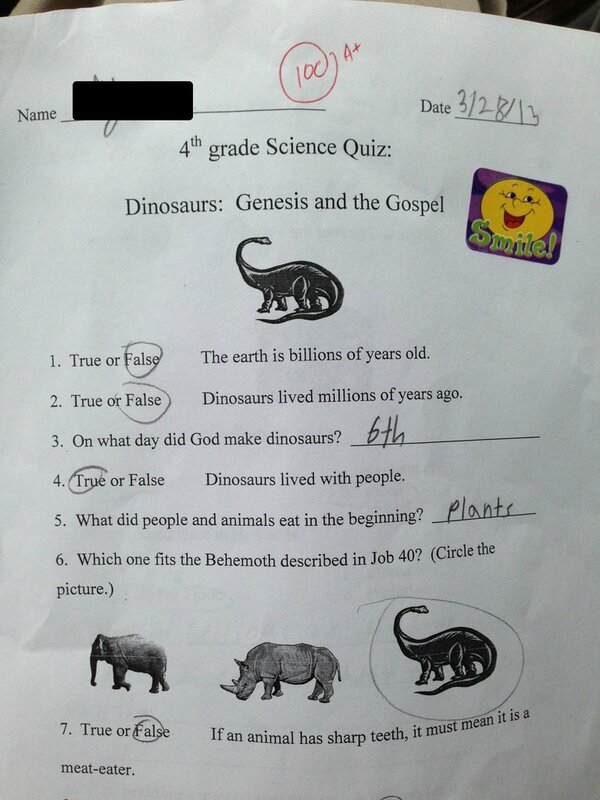 As it turns out, the quiz in question was given at the Blue Ridge Christian Academy in the town of Landrum, S. Carolina, north of Greenville. The children had been shown the DVD presentation “Dinosaurs, Genesis, & the Gospel” by Ken Ham and Buddy Davis, published by an organization called Answers in Genesis. The DVD expounds a “young Earth creationism” view of the Bible, which holds that the Creation story in Genesis is to be taken literally, and that the earth is six to ten thousand years old. The quiz tested the children’s knowledge of what was taught in the video. The moment a photo of the completed quiz hit the Internet on the r/atheist forum at reddit.com, the heated rhetoric began. Heated rhetoric between Creationists and Evolutionists is nothing new. These secularists want to impose their anti-God religion on the culture. They are simply not content using legislatures and courts to protect the dogmatic teaching of their atheistic religion of evolution and millions of years in public schools. Dogmatic teaching of atheistic religion? Just for the record, I happen to believe that very literal interpretations of the Bible are mistaken. But should we really be hurling insults at one another over our differing beliefs? Even if we sincerely believe that someone else’s beliefs are utterly wrong, does that justify condemning them and subjecting them to invective and attack? Whether or not we happen to agree with others’ beliefs, the important thing is how they live. Do they care about others and serve their fellow human beings in constructive ways? If so, then no matter what kind of funny beliefs may be banging around in their heads, their actions show that they believe in love, compassion, and service. And according to Jesus, our actions—not our mere beliefs—will determine our ultimate place in heaven or hell (see Matthew 7:21-23; 25:31-46). That’s another way of saying that our actions display our true character as human beings. Lawrence Krauss and his fellow scientists are worried that if so many Americans are being taught so much bad science, our country is bound to fall behind in scientific and social advancement. Biology and physics, they say, are crucial to the technological innovation that keeps us at the forefront of human development. However, not everyone has to be at the forefront of biology and physics for society to function and to advance. In addition to the scientific elites who push forward the boundaries of knowledge and technological capability, society needs many other types of people in order to function well. Where will all those scientists pulling all-nighters in the lab get their coffee and donuts if there aren’t people to run Starbucks and Dunkin’ Donuts? How will they invest their earnings if there aren’t money managers and investment bankers to manage their IRAs? Even if, as some polls say, 1/5 of Americans still think the sun orbits the earth, how many people’s jobs actually depend on knowing that in fact, the earth orbits the sun? People can have many false and faulty ideas, and still serve necessary and useful functions in society. To put it simply, people can have false beliefs and still be good citizens and good neighbors. The fundamental question of human worth is not whether people’s heads are on straight, but whether their hearts are in the right place. Even people with enlightened scientific or religious beliefs can be intolerant, prejudiced, and downright nasty to those who disagree with them or get in their way. And even people with crazy and laughable religious or scientific beliefs can be loving, kind, thoughtful, and useful to their fellow human beings. For those whose hearts are small and intolerant, even the best beliefs in the world will not save them. As for children who are brought up in fundamentalist Christian homes and communities, once they reach adulthood they will be able to evaluate their upbringing for themselves, and move on to less literalistic religious beliefs and more accurate scientific beliefs if they so choose. There are many atheists who grew up in conservative Christian households. And many Christians who were conservative and fundamentalist in their younger years adopt broader and more thoughtful forms of Christianity as they move into their middle and older years. Yes, lots of kids are being taught some rather unscientific and outlandish stuff. But it’s not the end of the world. If they’re at least taught to love their neighbor, they have the foundation for a good life. And if as adults their hearts are in the right place, and they are engaged in work that serves society, their heads will eventually follow. Even if they do hold onto their false beliefs to their graves, their life of love toward the neighbor and service to the community will far outweigh the faulty ideas under which their minds labored. Perhaps eventually our society will reach an enlightened consensus about the beginning of the world. Meanwhile, if we cling tenaciously to conflicting beliefs, it’s really not the end of the world! ‹ Why Didn’t Moses Lead God’s People into the Holy Land? Lee, you make good solid sense here. I personally think the Bible is a very valuable document and I agree that it is, at its very deepest level, inspired by God. But this inspiration must necessarily come through human beings and, it seems to me at least, always carries the distortions and beliefs that the particular humans who wrote down their inspirations assumed to be true. So there are absolutely spectacular writings in it and there are quite bland parts. What really counts is how the words we read move our hearts. To me, a literal interpretation of the words of the Bible is a very sterile intellectual approach to its contents that can get us quite distant from its heart-warming potential. I agree with you that there is no real need for all the heat and vindictiveness in the evolution-creation debates. But I do not think it is likely that those with a strongly literal approach to the Bible are going to change their position. I think scientists, though, can be reached with a strong argument. We should encourage them to just ignore the actions of the creationists. You are absolutely correct, the kids in these schools will eventually see through the errors. Your article is good common sense approach to the problem. It gets my thumbs up! About the Bible, I agree that it has both a divine and a human component. Unfortunately, there is much confusion about how the Bible can be God’s Word if it is filtered through the particular cultures and mores of its human authors. But the fact that it has a human component, far from vitiating it as a divine document, makes it all the more powerful once the true nature of the Bible is well understood. This is a subject that I plan to write a future article about. Meanwhile, my post “Can We Really Believe the Bible?” does cover some related subjects. Really nice post. A healthy and calming perspective. Thanks for stopping by! Glad you enjoyed the post. Thanks for visiting! I moderate only first-time commenters. There have been a few comments that I really did not want to subject my readers to, if you get my drift. From now on, you’re free to visit and share your thoughts here as much as you like. Meanwhile, I’m glad you enjoyed the article! When I learned that this test was given at a private school, I ignored all the discussion about it. People should be free to teach their children the any outlandish thing they want. But I think that ignores a larger point. There are a lot of my fellow Christians who are portraying themselves as a persecuted minority in order to quell any opposition to their political agenda. (When in fact Christians are the most powerful group on earth. If you doubt it, just count the number of nuclear bombs under the command of a Christian compared to all other religions combined.) They are successfully using their power to get their religious beliefs (young earth creationism) taught in public schools under the guise of calling it “science”. Just because you believe it is true does not make it science. By and large, politicians are afraid to oppose them. They don’t even have the theory correct. They talk about the “Theory of Evolution”. There is no such theory. The scientists who have studied the matter regard evolution as an observable *fact*. The name of the theory is “evolution (fact) by natural selection (explanatory theory)”. Just by failing to make this distinction they are not teaching science. When a group protected only by a principle (separation of Church and State) are opposed by a politically powerful group, it is not surprising they become shrill in defense of their position. Thanks for stopping by, and for your thoughts. If I were to delve into political views, we’d have a whole different conversation. Suffice it to say that I’m a strong supporter of separation of church and state. I am very concerned about inroads being made in both directions to link churches more closely to federal, state, and local government. However, since this is a spiritual blog, I’m more concerned here about the spiritual implications of the debate about creation vs. evolution. That includes the psychological effects on the children. I do believe that children are resilient. Despite a questionable education in their school years, they are able to recover from it as adults if they so choose, and move on to more thoughtful and rational positions than they were taught as youngsters. Yes, there is a loss when children are poorly educated. But there is an even greater loss–a loss of freedom for both adults and children–if the state presumes to impose particular methods and content on the education of all children. Though I don’t support teaching creationism in public schools, I also don’t think it is anywhere near as damaging as some believe it is. If nothing else, it will make the children aware that there is a serious controversy in our society over how the universe was created, so that eventually they can make up their own minds. I believe that over time, young earth Creationism will decline in popularity. I also think you missed the scientists concerns (many of whom are not athiests, by the way, and do not need to be convinced of the value of the Bible). It is not that children aren’t being taught *facts*, it is that they are not being taught how to *reason*. Whether you are a rocket scientist or a barista, lack of ability to reason is dangerous to democracy. Yes, good point: there are many scientists who believe in God, and many scientists who are Christians and revere the Bible as God’s Word–albeit not usually in the literalistic way that fundamentalist and evangelical Christians do. However, they are not usually the ones who are most shrill on the scientific side of the debate between scientists and fundamentalists over evolution vs. creation. The thing is, these “conflicts” between science and religion are all quite easily resolvable with a more rational and spiritual view of religion and a more open-minded view of science. However, don’t get me started on the sort of job the schools are doing in teaching children how to reason–or even to function effectively in the working world. The fundamentalist schools do not have a corner on the market of turning out students who, at the end of their years of primary and secondary schooling, still are not equipped with some of the most basic knowledge and thinking ability needed to be solid, contributing members of society. I believe that crossing a busy road is safe if I close my eyes as God will protect me. One is fact one is faith or belief. I know which one I trust to be taught to children. Your description of teaching children to read is essential; however this must be based on fact. The air is compromised of various gasses it is not belief it is fact. It is belief that a book mus-translated through various languages over several thousand years (old and new testament) gives an accurate view of the world’s development. Scientists to believe. They propose hypothesise that may prove to be correct or not. In modern science these are tested by other scientists. This leads to probability of fact not absolute certainty but highly likely. It is highly likely that you will be killed or seriously injured in my first example, not fact. So to use the same reasoning on the creationist view of the world ends with a highly unlikely based on analysis despite the faith of those who believe it. It is highly unlikely that a book (which is contradicted in other contemporaneous records) is a factual account of what happened, just as Galileo’s view of the solar system was incorrect. Five hundred or more years ago all Christian religious leaders thought the world was flat because the bible told them so, or so they said, it isn’t. Just to be clear, I agree with you that creationism as taught by many fundamentalist Christians is incorrect and false. To use your example, the belief that “crossing a busy road is safe if I close my eyes as God will protect me” is a false belief. God will not, in fact, protect you if you close your eyes and cross a busy street. Similarly, the idea that our solar system was created in six days is a false belief. The point of the above article about the debate between Creationists and Evolutionists is not to say that each should get a fair hearing and all sides should be considered. Rather, it is to say that engaging in invective and attack upon one another is not a reasonable or constructive way to proceed. Many people hold false beliefs. In an ideal world, that would not be the case. But we don’t live in an ideal world. We live in the world that actually exists, in which large swaths of humankind believe many things that simply aren’t true. But that is not the biggest problem we humans face. Even people with false beliefs can be good citizens if their hearts are in the right place, and they devote their lives to serving their fellow human beings in some useful and constructive way. The main point of the article is to say that as important as our beliefs are, how we treat one another is more important. If our beliefs are correct, but we engage in invective and attack against those who adhere to beliefs we consider false, are we really improving the human situation here on earth? Thanks for the eloquent reply and the comment on my own blog. My concern is that by not forcefully challenging many of these beliefs many children end up being falsely educated this could disadvantage them for life. Of course the educators want that to happen they want to perpetuate the myths and life order they have created. Priests remain unchallenged even when child abuse is known as has happened in the Catholic Church. The tone of any argument should be reasonable but many in this discussion have no reason. They have faith and insist that their faith is the right one everyone else is a heretic and should be burned at the stake. In Nigeria literally, in Pakistan stoned and in the USA via the media unless you are working in an abortion clinic when you are fair game. So false and overpowering is the belief that Presidential Candidates claim to be religious just so as not to avoid losing votes. A nation that was partly founded on escaping religious persecution now persecutes non-believers. The UK is not so bad but it contains the signs. I share many of your concerns. There are no easy answers. However, I believe that as humanity progresses, these old and reactionary religious views will gradually wane on the world stage in favor of more enlightened views. I agree that it is necessary to confront and combat old and mistaken beliefs. But this should be done with respect for the human beings involved, not with invective and vitriol. Approaching it emotionally, with anger and hatred toward one’s intellectual adversaries, only throws gasoline (petrol, for you) on the fire, and inflames things further. I regularly combat old, mistaken religious views here on Spiritual Insights for Everyday Life. However, I attempt to “stick to the facts”–meaning focus on the ideas themselves–and not engage in the invective, insult, and personal attack that mars so much of the debate between modern science and outdated religion. This ongoing confrontation between groups staunchly holding to their own convictions, to the point of being abusive towards others, really is an issue. Fundamentally, it is no different than the age-old debate between the pessimist who sees the glass as half empty, and the optimist who sees the glass as half full. Both are right in the context of what each believes to be true (which, in this case, can be proven true from either point of view), and there is no reason to persecute the other for thinking differently, especially when, in reality, both are right. Why not agree to compromise, and simply state that we all ‘evolved’ from ‘creation’? That still leaves a plethora of unsubstantiated truths on both sides of the table for each respective party to work diligently toward realizing and understanding, each in their own ways, without compromising their different principles or positions. I have sometime been intrigued by Jesus’s comment that “You will identify false teachers by their FRUITS.” Fruits, not beliefs. Of course, Paul seemed to be much more concerned with what was actually being taught, but Jesus’s comment does seem to confirm your idea that actions are more important. Yes, Paul heavily emphasized faith. But take a look at Romans 2:1-16. There Paul, too, makes it clear that when our time of individual judgment comes, each of us, regardless of our faith or religion, will be judged by what we have done. And of course, there’s the granddaddy of them all: The Sheep and the Goats in Matthew 25:31-46. It really doesn’t get much clearer that we will go to eternal punishment or eternal life based on what we have done. I know you called for calm but really this is the sort of thing all reasonable people should be hopping mad about. For most practical purposes (aside from say a real science exam) the age of the earth or Universe is totally irrelevent to me, as is evolutionary theory, or indeed whether the earth is flat or not. In a certain sense, I honestly couldn’t care less if other people ‘believed’ in the big bang or not. The reason why we should get angry is that we have people deliberately spreading what they know full well to be lies, ignorance and idiocy. Lies and idiocy that happen to make a nice profit for some. It’s when this same ignorance of reality is applied to such matters as say human-caused global warming that we see the danger in it. Believing in something not just without evidence, but in the face of mountains of contradictory evidence, is a huge problem, especially when the ignorance finds its way into the heads of policy makers. The other issue is how easy is it really for young minds to purge themselves of this nonsense, once it takes a hold. As an example of how insidious these things are, and I’m not just saying this to be snarky, but Lee, when you say, “If nothing else, it will make the children aware that there is a serious controversy in our society over how the universe was created”, it seems like you’re conflating the theory of evolution with cosmology, exactly as the fundies do! People can get upset about these things if they want. But when they start personally attacking and vilifying those who are on the opposite side of the question, that’s where I take exception. In my experience, most creationists sincerely believe what they’re teaching, and do not have bad motives. In my opinion, they’re simply stuck in a very rigid and materialistic view of religion and the Bible. Yes, some of them are hypocrites who are making money and a following from these teachings. But most are just ordinary people stuck in a very shallow form of religion. As for evolution and cosmology, in the minds of most creationists, the two are very closely connected. And even in secular science, evolution is part of the scientific theory that dovetails with the general cosmological perspective saying that the earth, and the universe, are billions, not thousands, of years old. I recently had a conversation with a creationist gentleman, and I realized that more than anything, it’s genuinely sad that so many people have learned beliefs that limit their understanding of both the wonderfully complex nature of the universe and of the rich truths the Bible has to offer on a spiritual level. Yes, it’s unfortunate. There is so much more to the Bible, to Christianity, and to life in general than fundamentalists and literalists see. They’re missing out on a whole world of spiritual life. But that’s as far as some people’s minds travel.